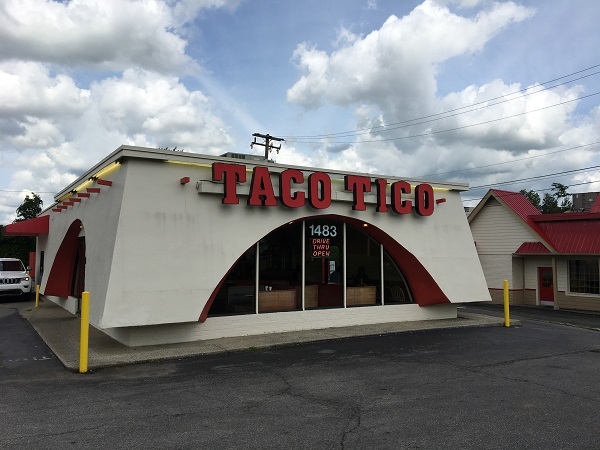 Taco Tico, Lexington KY – Marie, Let's Eat! Since we last spoke, there’s been a big and overdue change around the home front. Since moving to Chattanooga, I’d been working for a small non-profit agency. It was a part time job, which paid the bills and let me do good things for people who needed help, but it hasn’t left us with very much “get out and play” money. I looked for full time work in my field for months and months… agonizingly discouraging months, actually, but I finally gave up and went back to the corporate world for a much, much larger salary. Marie and her family had already planned a long weekend on Saint Simons Island, but the timing of this new start meant that I couldn’t join them for all the dates planned. But, three weeks into my job, I was able to take a change of clothes and hit the road as soon as we finished on Friday. I debated where I wanted to go, and the craving for Cincinnati-style chili won out. The closest Gold Star is in Berea KY, and Lexington, a city we’ve never really explored in depth, is just thirty-odd more miles up the highway. The final push to go look at Lexington came from a fascinating new blog which started up earlier this year and which I’m sure all of our few remaining readers will completely love. It’s called Broken Chains and it’s a detailed look at the stragglers and survivors left behind when regional or national restaurant or retail chains shut down. 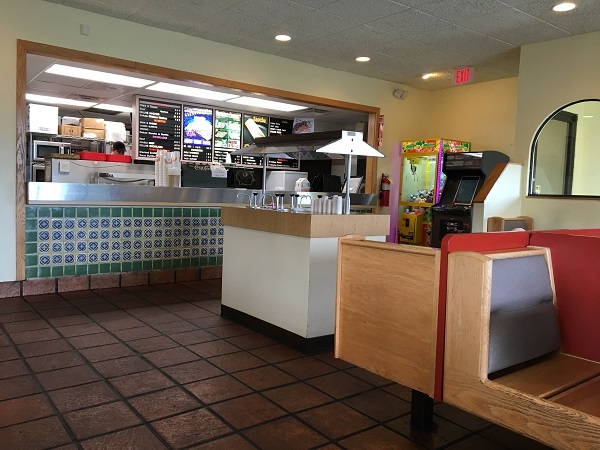 The blogger is particularly intrigued by Taco Tico, which he loved as a kid, and has written about it two times. The Taco Tico chain is based in Wichita, where Dan Foley opened the first restaurant in 1962. At their peak in the 1980s, there seem to have been several dozen locations throughout the midwest, with stores all over central Kentucky. Only one remains in its classic adobe-style building, though there is just one other Taco Tico in a Lexington strip mall. I was inspired by the nostalgia and attention to detail in the post, and so I decided to check out Taco Tico. Let’s just stampede through the disaster of this trip. Yes, the five-way that I had at the Berea Gold Star was completely wonderful, and yes, the awesome hotel room that I splurged on in Richmond was a fantastic indulgence. Then everything fell apart. For breakfast, I went to the Tolly-Ho, an iconic hangout for University of Kentucky students which we had intended to sample in 2012, and sampled two passably okay burgers. After some good shopping at Half-Price Books, I had some mediocre, greasy pulled pork at a promising place called Red State. These wouldn’t make good chapters. But Taco Tico… this was kind of interesting. The owners of this location froze it in a time warp, locked around 1978. If you want to visit a classic, no-frills fast food joint from forty years ago, you should check this place out. I sampled a sancho and a regular crispy taco. You still see sanchos on the menu at the Taco Casa stores around Tuscaloosa AL, and you used to see them at Athens GA’s Taco Stand locations. 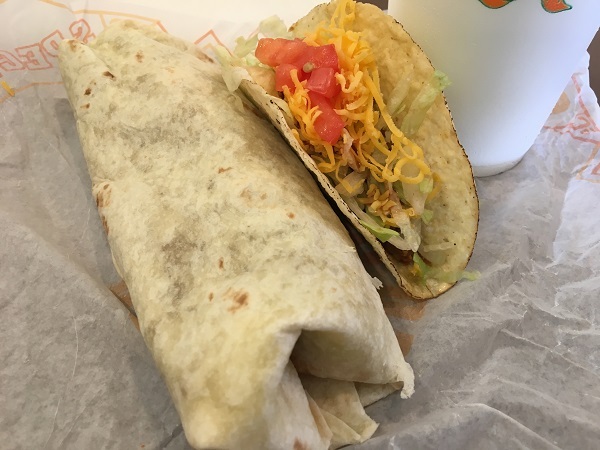 It’s a deluxe burrito without sour cream, basically. Is it possible that Taco Tico coined the word? Neither snack appealed to me much. With a lot of childhood fast food memories, you’re adding nostalgia to the ingredients, and a so-so menu item can be elevated. It was better than Taco Bell, but so are lots of other things. I love the building, and I love that they’ve kept it ticking along without changing much, but I doubt I’ll ever return. Although, I couldn’t help but notice there’s a twenty year-old barbecue place called Talley’s right next door. If I weren’t full, I’d have stopped in. So an hour later, I’m driving south on I-75, reflecting that I don’t have three stories here, and certainly not four, and hoping for the best from a long, long overdue stop on my bucket list, the Root Beer Stand in Corbin KY. There are people who rave about this place. The locals keep the carhops constantly moving, as a steady stream of drivers wait for a spot to open. It’s one of the craziest, busiest restaurants I’ve ever visited in the middle of an afternoon. And the chili is terrible. I’m not using weasel words like passably or mediocre, this is the hands-down nastiest chili I’ve had in as long as I can remember. Posted on July 29, 2018 by Grant G.Posted in kentucky, lexington, local chains, mexicanTagged fast food, kentucky, lexington, local chains, mexican. Did you go to Gold Star just because it was closer, or because you like it better than Skyline? I actually think I like it better, but it seems I’m in the extreme minority with that opinion. I recently took some time to explore some of the local chili parlors in Cincy and found some other great ones. But really (and this is coming from a Tennessean and might offend a Cincinnatian), they’re all more alike than they are different, right? I’m a big fan of Taqueria Ramirez in Lexington. And Spalding’s Bakery. I saw Spalding’s Bakery and was a little curious, actually! Maybe next trip. And yes, I did pick the Gold Star because it was closer and I could get to it quicker than a Skyline. I can’t tell much difference between those two either, but Camp Washington is in a class by itself! Hi! I’m Zap Actionsdower of Broken Chains. Thanks for reading and for the shoutouts to my blog. I hope I didn’t overhype Taco Tico too much. You’re right about nostalgia making it taste better. No worries! I enjoyed the visit even if I wasn’t wild about the food. Good people, great experience. Keep up the super work. Sorry there were some underwhelming points on your trip. However, excellent timing as the mister and I were just discussing a trip to Kentucky (maybe!). I’m a Taco Stand (over) enthusiast and am all about hitting up Taco Tico if we get the chance. I think the I-65 corridor is much, much more interesting than what’s on I-75! I’d love to go back to the Owensboro and Henderson areas sometime in the near future. I found some fabulous meals out that way.